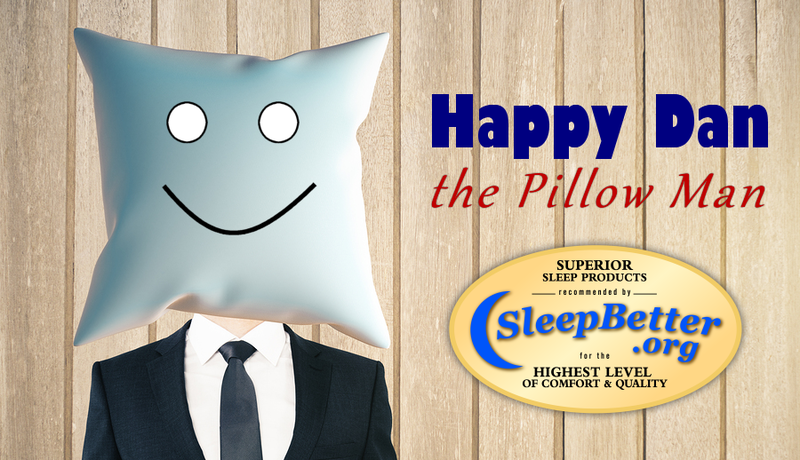 In this edition of Ask Happy Dan, Dan answers a number of questions about feather pillows, CPAP and bedding quality. Donna Burnette: How long will a feather pillow last? By weight a feather is as strong as titanium and serves as natures natural spring. Here is the key – for a quality pillow the feathers MUST be very small and highly curled. Most of the feather pillows sold in the U.S. are big feathers that have been chopped up! YUCK! Not only that but because they are so big, the quills poke through the fabric and stick you. Another YUCK is called for here. So says Happy Dan the Pillow Man. If you are using a common polyester pillow you should by a new one when it begins to break down and go flat – usually every six months – a quality foam pillow can last for years – high quality feather and down pillows (high quality is hard to find) will last years. Keep you sleeping tools clean and fresh! So says Happy Dan the Pillow Man. Brandy Crainer: What’s the best alternative to feathers? The best alternative to feathers is a polyester filled pillow. It will provide you with both support and comfort. Make sure that you feel the filling through fabric. The slicker the fill the better. Take caution here and remember you get what you pay for. A pillow that has cluster fiber may be okay, but a gel fiber would be better. So says Happy Dan The Pillow Man! Clif: I don’t think it starts and end with just the pillow. 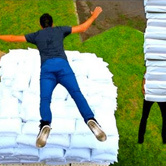 We have tried several mattresses, foam filled, and we have found most of them are CHEAP FOAM. And, try an imported one, they are worse. There doesn’t seem to be a bedding industry standard or even a filling standard. The cushions in my friends sofa, are flat and they are less than 6 months old. Imported stuff is awful. I hope you make progress in informing people you don’t get what you pay for, cause no one tells you what it really is. I could NOT agree with you more and that is why we are on a mission with the Great American Bad Pillow Project to tell people the truth. It makes zero difference what the fabric is. What is most important is what is inside, and that is true of polyester, foam and feathers. The problem is that the important stuff is blind to the consumer. As you so aptly stated “You Get What You Pay For.” We need to take our time when buying bed pillows, toppers and mattresses. My only purpose for being these days is to answer your questions so you can begin getting the rest you need to stay healthy. So says Happy Dan the Pillow Man. Renee Jones: What do you recommend as far as a pillow is concerned for someone with severe sleep apnea that sleeps nightly with a CPAP machine and headgear? Preferably not a feather pillow. Well the first thing I would do is to ask the doctor. The second thing I would do is to find something that is adjustable and something you can scrunch when you move throughout the night. So says Happy Dan the Pillow Man. Check back soon for another edition of Ask Happy Dan. If you have a question for Dan, ask it on our Great American Bad Pillow Project page, and be sure to enter our contest for a chance to win one of three bedding makeovers, each valued at approximately $700!